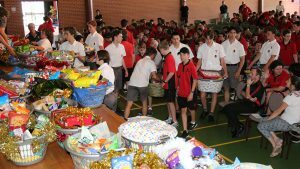 Parents are asked to support our annual St Edward’s Christmas Appeal by encouraging their sons to contribute to the Christmas hampers, which are organized by tutor groups. Other food items are welcome but please keep in mind that we are trying to create enough for a family to share a Christmas meal, rather than just snacks. Please contact Mr Pat Dell on 4321 6439 if you have any further questions.